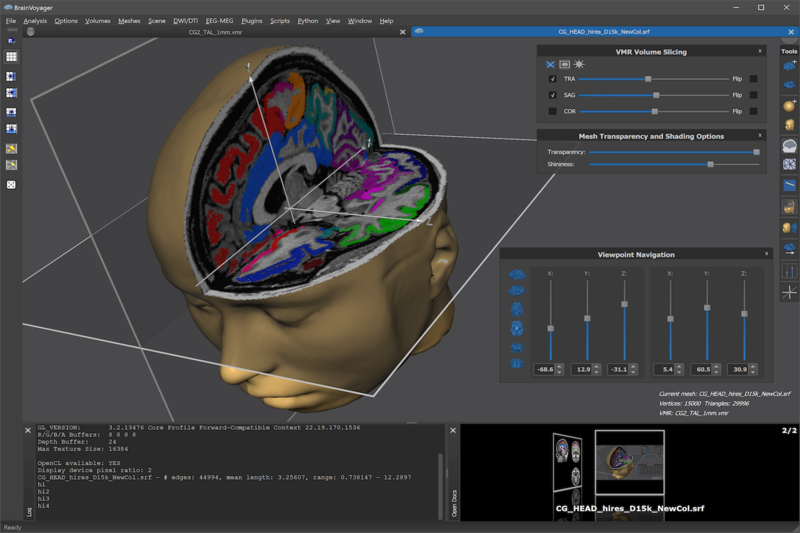 BrainVoyager 21 - New rendering engine and content-focused dark interface! BrainVoyager 21 - Improved Python support with content-focused dark interface! 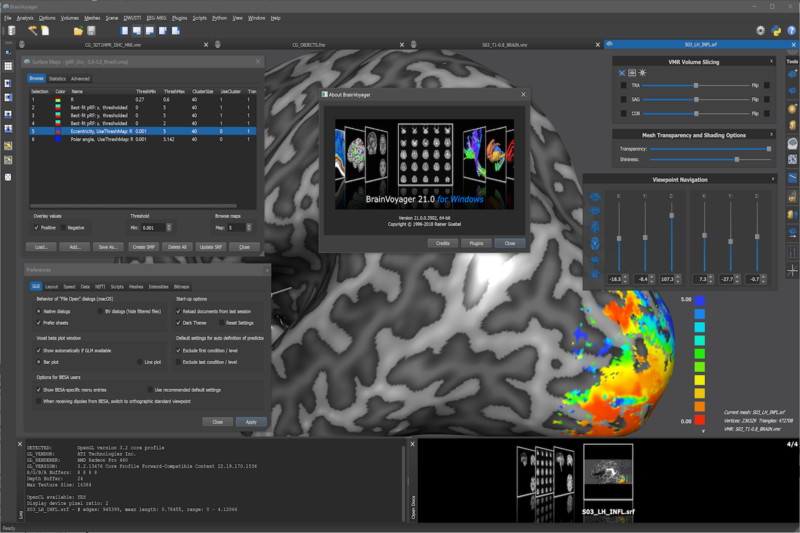 Our flagship product BrainVoyager is a powerful neuroimaging software package for data management and data analysis. 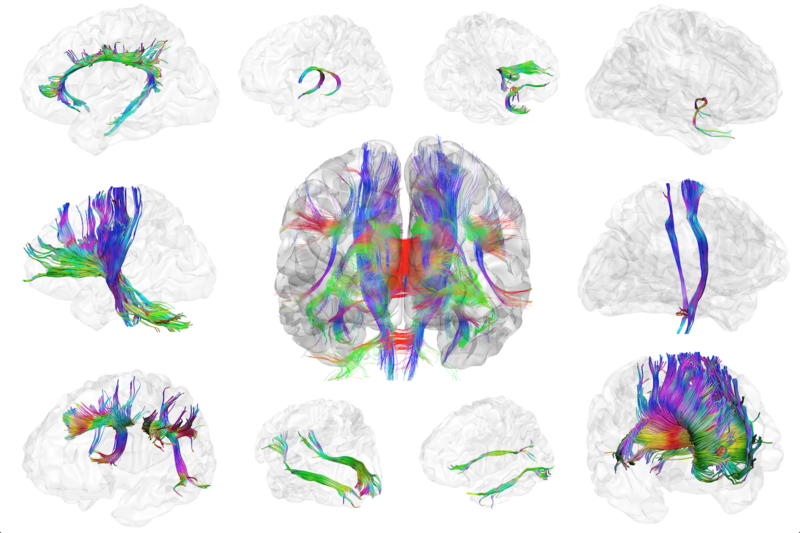 It started as a tool for the analysis of anatomical and functional MRI data sets but has evolved over the years into a multi-modal analysis tool for fMRI, DTI, EEG and MEG data. The software is highly optimized and user friendly running on all major computer platforms; the current version runs on Windows (7/8/10), Linux (e.g. Ubuntu, SUSE, Fedora) and macOS (10.10 or higher). BrainVoyager is a 64 bit program supporting analyses of large data sets that need more than 3 GB of RAM. In order to obtain maximum speed on each platform, BrainVoyager has been programmed in C++ with optimized and highly efficient statistical, numerical, and image processing routines. It supports on all platforms fast parallelized basic math routines using the Intel Math Kernel Library (MKL). The software also exploits modern multi-core, multi-processor hardware for the most demanding computational routines. Multiple parallel processing pipelines of modern graphic cards (GPU's) are used for real-time volume rendering, data filtering and sinc interpolation. The surface rendering environment ("surface module") has been implemented using OpenGL. The interactive graphical user interface (GUI) has been built using the award-winning cross-platform Qt C++/QML toolkit from Digia (formerly Nokia and Trolltech). Using cross-platform C++/QML code for all aspects of the program, BrainVoyager provides a native and responsive user interface and powerful computational routines on all supported platforms. A modern graphical user interface. New data management capabilities providing a hierarchical view on your data. New workflow tools allowing to specify, execute and document complete analyses across all subjects of an experiment. Very fast and highly optimized 2D and 3D analysis and visualization routines. A comprehensive set of efficient pre-processing tools, including motion correction, high-pass filtering and slice scan time correction. Fast and precise coregistration of functional and anatomical data sets including boundary-based registration. Automatic MNI and Talairach brain normalization tools. Volume and cortex-based hypothesis-driven statistical data analysis using the General Linear Model (GLM). Random-effects ANCOVA analysis for advanced multi-factorial designs and correlation with external (e.g. behavioral) variables. Nonparametric Permutation Inference for Multi-Subject Designs including threshold-free cluster enhancement. 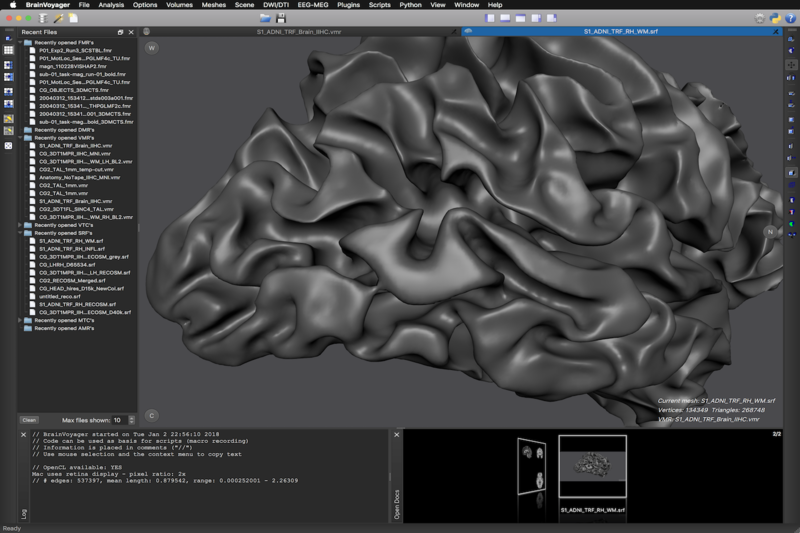 Cluster-size thresholding for correction of multiple comparisons for volume and surface maps. Multi-voxel pattern analysis (MVPA) tools, including support vector machines (SVMs) and recursive feature elimination (RFE). Distributed source EEG and MEG cortical imaging and analysis of EEG-fMRI coupling for simultaneous measurements with artifact correction. Analysis of Diffusion-Weighted Imaging (DWI) including combined visualization of tracked fiber bundles with structural and functional MRI. Dynamic statistical thresholding using the False Discovery Rate (FDR) approach for correction of multiple comparisons. Retinotopic mapping analysis using population receptive field (pRF) estimation as well as classical phase-encoded analysis. Multi-subject Volume-of-Interest (VOI) and surface Patch-of-Interest (POI) analysis. Volume and cortex-based data-driven analysis using Independent Component Analysis (ICA) performing single run as well as group analyses. 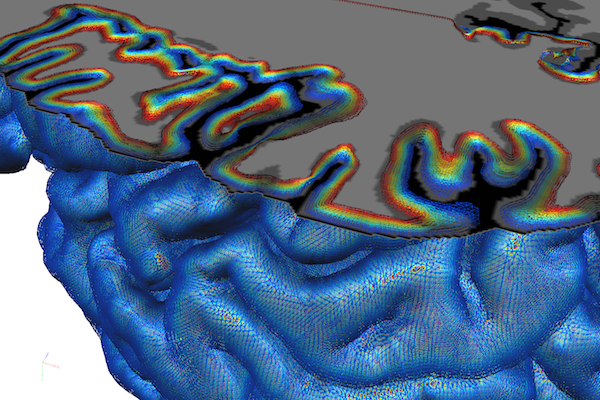 Cortical thickness analysis for advanced morphometry. 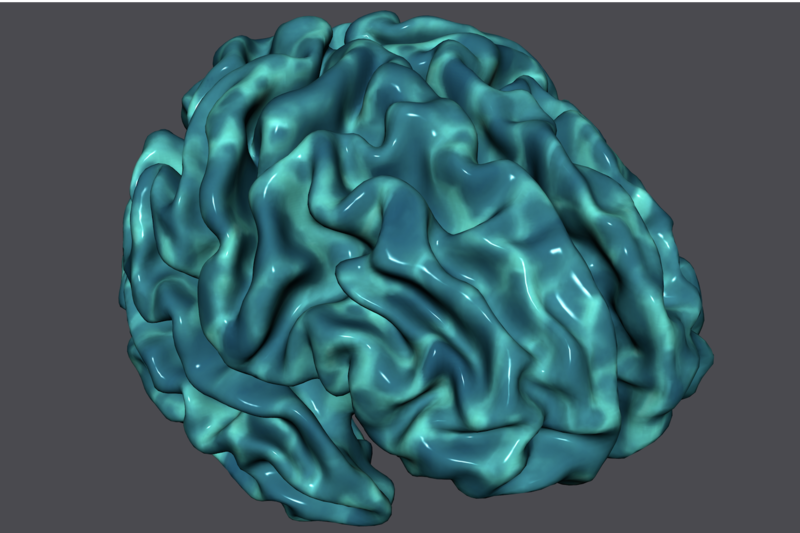 Advanced methods for automatic brain segmentation, surface reconstruction, cortex inflation and flattening. Cortex-based inter-subject alignment based on gyral / sulcal pattern of individual brains going beyond standard volumetric normalization approaches such as Talairach transformation. 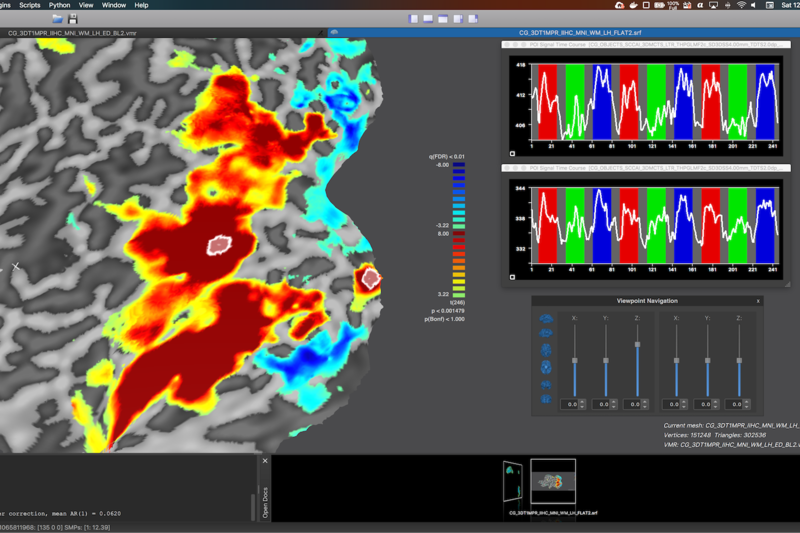 Creation ("seeding") and visualization of EEG / MEG multiple dipole models in combination with the powerful BESA program. Integration of volume and surface rendering with powerful tools for the creation of high-quality figures and movies. 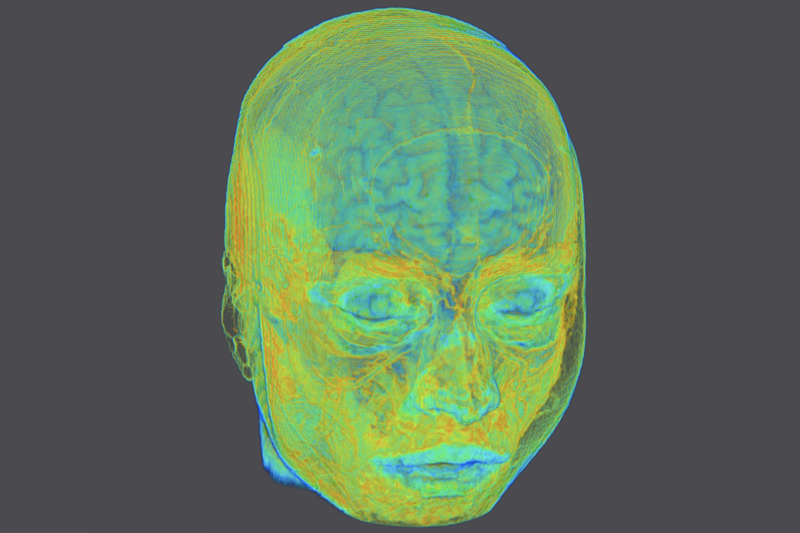 Advanced visualizations of anatomical and functional data sets with real-time GPU-based volume rendering. A real-time neuronavigation module as part of the TMS Neuronavigator system. Multi-core and multi-processor support and an open architecture with documented file formats. Cross-platform scripting support allowing to analyze the data from many subjects in batch mode. 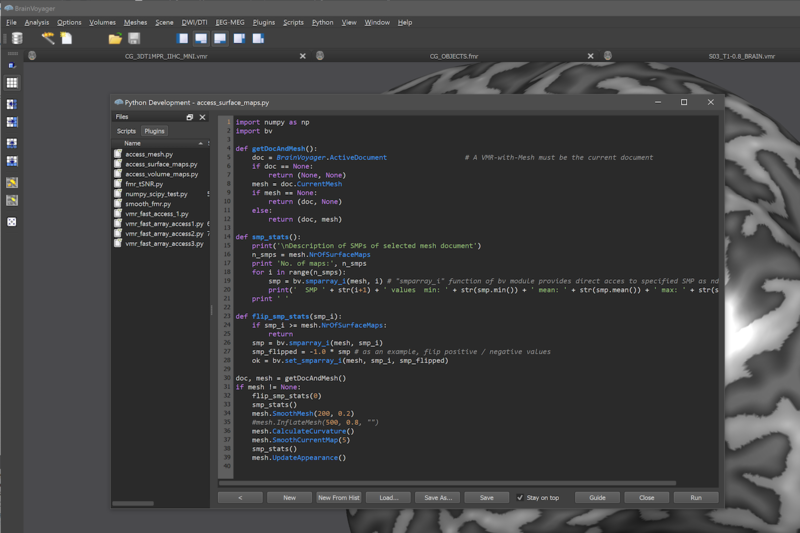 Cross-platform C++ plugin support which makes it possible to extent the functionality of BrainVoyager. The Windows version supports COM-based interfaces, which can be accessed with all major computer languages (e.g. C/C++, VB, Java) as well as from MATLAB. The macOS version supports AppleScript scripting allowing to automate BrainVoyager from outside the program and to integrate it in scripted workflows with other programs. Since BrainVoyager 20, it is possible to develop scripts and plugins using the Python language. Optimized native executables for all major computer platforms including Windows, Linux and macOS. BrainVoyager provides a comprehensive cross-platform solution embodied in a single product. The software allows easy exchange of data between platforms handling transparently potential byte order differences ("big endian" vs "little endian"). Data analyzed on one platform - for example Windows - can be moved to another platform - for example macOS - and processed further without any problem. Note that with BrainVoyager 20.0, the name and version numbering of BrainVoyager has been changed. The "QX" part from previous version names has been dropped since it is no longer necessary to stress the cross-platform nature of BrainVoyager. Furthermore, version numbers now follow a yearly release cycle starting with BrainVoyager 1.0 (Windows version) released in June 1996. In order to be compatible with previous naming and licensing terms, BrainVoyager 20.X is internally also coded as BrainVoyager QX 3.X.